Authorities say two arriving airplanes, including an Air Canada flight, touched wingtips while taxiing at New York's LaGuardia airport, but the planes were able to continue to their gates. Authorities say two arriving airplanes, including an Air Canada flight, touched wingtips after landing at New York's LaGuardia airport late Monday, but the planes were able to continue to their gates without a problem. 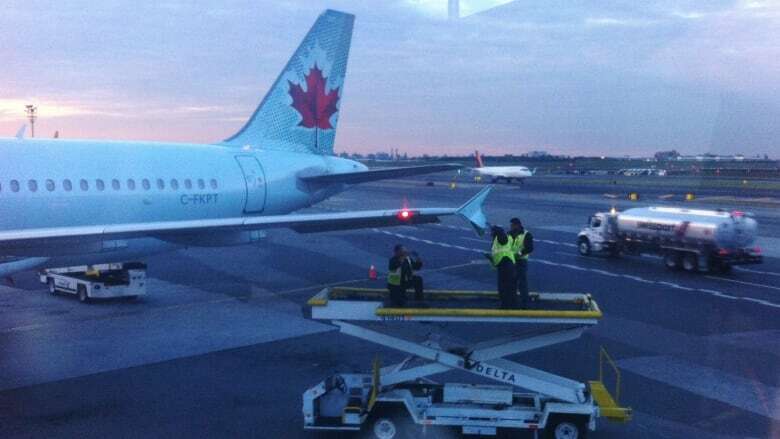 Rudy King, spokesperson for the Port Authority New York and New Jersey, said the Air Canada jet was stationary on the taxiway when an American Eagle plane operated by Republic Airlines that was attempting to turn clipped its wing. Air Canada spokesperson Angela Mah says the A320 jet was arriving from Toronto with 142 passengers on board who all disembarked normally, but that the aircraft is now out of service. King says one woman on board the American Eagle flight suffered a neck and back injury. The Federal Aviation Administration plans to investigate the mishap, which unfolded around 5:15 p.m. ET. The agency said the incident involved Air Canada Flight 716 from Toronto, and Republic Airline Flight 4589 from St. Louis. Last year, an Air Canada flight was involved in what the National Transportation Safety Board has suggested was just "a few feet" from becoming the worst crash in aviation history. The Air Canada plane nearly crashed into planes lined up on the ground at San Francisco International Airport. It swooped to just 18.2 metres above the ground while passing over other planes packed with passengers waiting to take off shortly before midnight on July 7, 2017.